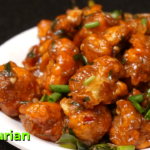 Gobi Manchurian is a spicy dish that is often sold by Indian Street Food vendors. Here, you can learn to cook gobi manchurian at home easily. Gobi Manchurian is a snack made by deep frying cauliflower florets coated in a spiced batter. These crispy florets are then covered with a sweet and spicy Chinese gravy adapted to Indian tastes. In our Hyderabadi Ruchulu channel you can learn how to cook street style Gobi Manchurian at home with clear step by step instructions in Telugu. Heat 1 tablespoon oil in pan.